One of my favorite neighborhoods in our area is Clifton. I’ve been in love with Clifton for years. When I was in high school we hung out on Short Vine going to concerts at Bogarts and shopping at Scentiments Rock City. When I was a bit older I hung out in Clifton while I went to graduate school at UC, although at that point my “hanging out” consisted of cramming for tests at one of the fine local eateries or on a park bench on campus. When we got married we continued to head to Clifton for dinner & movie date nights. There are so many great restaurants to choose from and the Esquire Theatre is my favorite movie theater in town. 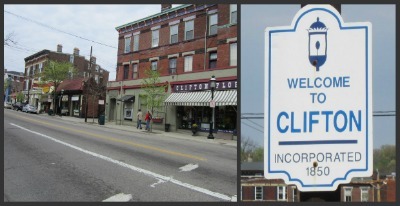 I have been a lifelong resident of Kentucky, but I think that if I ever moved to Ohio I’d love to move to Clifton. The homes and apartments in this area are gorgeous, and the neighborhood seems so friendly & full of life. I love the small-town feel that Clifton has, it’s such a vibrant & eclectic place to be. Now that I have four children, I still like to “hang out” in Clifton, although the date nights are few and far between these days. Now I look for family friendly things to do in Clifton. I’ve put together a list of my favorite things to do with the family in Clifton, please feel free to add your ideas in the comment section! Clifton is a great place for walking, whether you are looking to walk in the woods or walk in a neighborhood. Some places to walk are around Burnet Woods, the University of Cincinnati campus, or along Ludlow Avenue and the surrounding neighborhoods. We took a walk near UC this week, and it was fun for the kids because there was so much action going on all around us. There were students darting all around trying to get to class on time (the sidewalks are plenty big for a couple of Mamas with strollers AND the UC students to share), and there’s alot of construction going on between Calhoun & McMillon (the boys LOVED watching the big construction vehicles at work). I enjoyed the walk because I could smell all of the different foods cooking in the many restaurants around UC, and I love looking at all of the cool architecture in this area and also reminiscing about my younger days. There are so many dining options in Clifton, I really cannot list them all (but if you have a favorite, please tell us in the comment section!) A few of my absolute faves in Clifton are Ambar India, Myra’s Dionysus, and Pomodori’s Pizza. All three restaurants are family friendly, and have delicious foods. Ambar India has several sister restaurants around town: Guru India, Baba India, and others. And I think that every one of them that I’ve eaten at has been a great dining experience. The food is always perfect & tasty, and the service is top-notch. If you are in the mood for yummy Greek fare, then head to Myra’s Dionysus. Their food is not just delicious, but affordable too. And they have outdoor dining available as well. And if it’s pizza you are wanting, head to Pomodori’s Pizza, they use fresh ingredients and their pizzas are wood-fired. I’ve always enjoyed dinner at Pomodori’s! Depending on what kind of food you are in the mood for, chances are you can find the perfect restaurant to fit your cravings in Clifton. While you are in Clifton, be sure to spend a little time in Burnet Woods. It’s a great park for so many reasons. There are hiking trails, a small lake for fishing, a disc golf course, a small playground for the munchkins, and more. It’s really a beautiful park (90 acres) nestled right into this bustling town. I’ve not tried their hiking trails yet, but I look forward to it in these warmer months. There are always alot of people in this park..students from UC playing softball in the grass, people reading in the beautiful historic gazebo, runners, dog-walkers, children laughing in the playground, and families having picnic lunches in the shelters. My favorite place to shop for unique gifts is in all of the sweet shops along Ludlow Avenue. My children’s favorite is Toko Kidz. It’s a tiny little store crammed full of wonderful toys, books, puzzles, games, clothes, and more. Not your typical toys that you find in the big box stores, but unique items like Uglydolls, whooppee cushions, puppets, science experiments for kids and much much more. 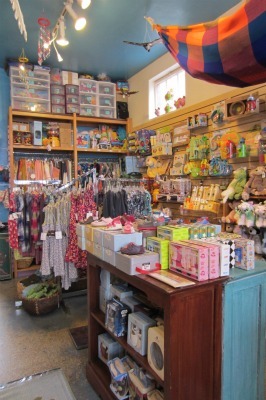 They also have a great little baby corner where they sell adorable tie dye shirts, Robeez shoes, Baltic Amber jewelry, books, bath toys and other unique gifts. 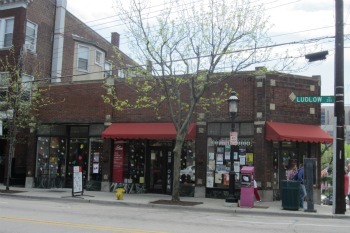 Visit the charming Clifton branch of the Public Library of Cincinnati & Hamilton County to take a break from your playing & shopping and pick up a few books to take home and read to the kids at bedtime, or stay and read books to the kids there at the library. See their website for all of the details on hours of operation, etc. For more fun things to do around Clifton, be sure to read Kristin G’s post about her adventures on Ludlow. 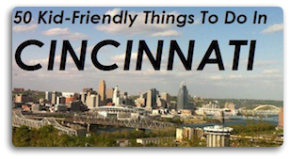 Please share in the comments what your favorite thing to do in Clifton is with your family. We headed to Clifton yesterday to wander the streets and look at the beautiful old Victorian homes,The air was crisp and the streets were all decorated for Halloween.It was fantastic.We plan to go back for Christmas.Thank you for introducing us to a great city! We spend the day in Clifton today. Visited Olive’s for their yummy brunch, then saw the Frisch Marionettes at Clifton Cultural Arts Center and capped off the day at Burnett Woods – enjoying the playground. We love visiting Clifton. Dewey’s Pizza on Ludlow is divine also, with a gourmet flair. And the best sushi in town is in Clifton also–on McMillan Street at Maki Express, across from Starbucks. At Maki Express, you can get 3 sushi rolls on their lunch menu for about $10. Their Chef’s Special rolls are to die for, but more expensive of course. And then there’s Rohs Street Cafe, an eclectic grassroots coffee shop with open mic nights and a basket for food donations for homeless or underprivileged people. On Short Vine, check out Island Fryday’s for the best Jamaican food ever! And the public library on Short Vine is an original Carnegie Library, a beautiful building. I cant wait to give Clifton a go! Thank you for all the great ideas! I think we’re going to have a blast! I love the Memorial Day parade and grill out in Mt. Storm and also the Streetscapes that takes place in September. Artists use sidewalk chalk to transform Telford Ave and kids can also create their own materpieces on the street. Its so much fun!